The House Without a Key by Earl Derr Biggers – Charlie Chan 1. The novel deals with the murder of a former member of Boston society who has lived in Hawaiʻi for a number of years. The main character is the victim’s nephew, a straitlaced young Bostonian bond trader, who came to the islands to try to convince his aunt Minerva, whose vacation has extended many months, to return to Boston. The nephew, John Quincy Winterslip, soon falls under the spell of the islands himself, meets an attractive young woman, breaks his engagement to his straitlaced Bostonian fiancee Agatha, and decides after the murder is solved to move to San Francisco. 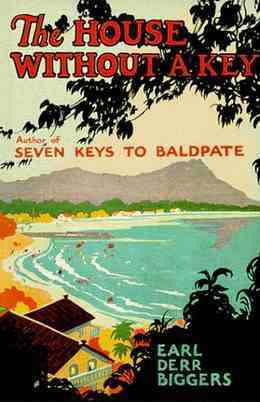 In the interval, he is introduced to many levels of Hawaiian society and is of some assistance to Detective Charlie Chan in solving the mystery.